I mentioned last week that my book of choice for the month has been Madeleine Shaw's Get the Glow. I've been following Madeleine on social media for a little while now so, as soon as the book arrived through my door, I couldn't wait to get stuck in. But first, a quick disclaimer. 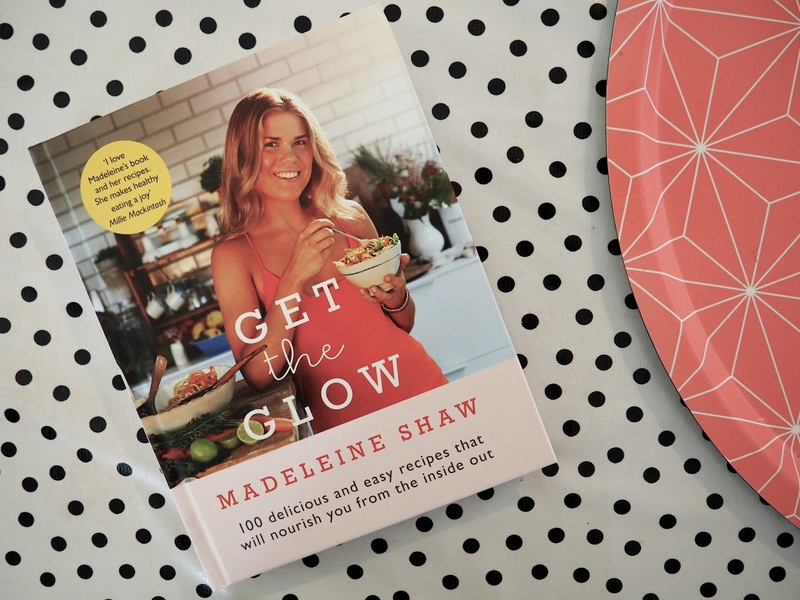 I'm not following the Get the Glow plan religiously (*hangs head in shame*). Yet. I know its probably easier in the long run if you jump in feet first and just go for it. But I didn't want this to be another failed attempt to make changes in my diet. I want this to be a gradual, positive adjustment that helps me to make healthier choices and feel my best. I made the switch to almond milk a long time ago, and I don't eat a great deal of other dairy, so I didn't have to worry too much about cutting that out of my diet. But also, I'm not going to beat myself up over a Ben & Jerry's relapse, or cheese at Christmas. Seriously, no cheese at Christmas would be torture. Sugar is the big change for me. I don't eat loads, but I need to reach more for the raw cacao protein balls and less for the Hob Nobs. Sigh. So here are the first few picks from the book that have got me excited. The ones I've tried, tested and will definitely make again. Turkey Meatballs in Homemade Tomato Sauce, with Courgetti. This one had me worried if I'm honest. Turkey mince didn't really appeal to me and it looked less than appetising at preparation stage. Also, I don't like courgette. Obviously a no-brainer for my first pick from the book! I needn't have worried. This was seriously tasty. The meatballs were slightly drier in texture than their beef counterparts would be, but still tasted great. I made my usual simple tomato pasta sauce, which is basically shallots, garlic, tinned tomatoes, sea salt and pepper - except I softened the shallots in coconut oil, instead of my usual olive oil. Also, I heated the courgetti through a little in a pan rather than serving it cold as the recipe suggests. I was really pleasantly surprised at the results. Seems I like courgette if it's in spaghetti shape. Who knew? Chocolate Peanut Butter Balls. I actually pinched this idea from ViviannaDoesMakeUp, who used the recipe for Raw Chocolate Peanut Butter Brownie Cake, but rolled the mixture into bite-size balls instead. They're perfect for seeing off those pesky mid-afternoon sugar cravings. Sweet enough to satisfy, and healthy to boot. Chickpea and Red Lentil Dahl, with Coconut Cauliflower Rice. This was an absolute revelation. So much so, I can't wait to make it again. The dahl was full of flavour, filling and the perfect antidote to Friday-night curry cravings. Again, I was a little sceptical about how well cauliflower rice would work as a substitute to my beloved basmati. But this, cooked in coconut milk, was amazing. I may have got a bit too excited at the blitzing stage and turned it more into cauliflower mush than rice, but flavour-wise it was a real winner. I've just got to restrain myself with the Kitchenaid next time. So these are my top three picks from the book so far. I'm making the Mince Beef with Lettuce Wraps this week and am currently soaking oats for tomorrow morning's Bircher Muesli. I'll let you know how I get on with those.